Prof. Raj Kumar appointed as Vice Chancellor of Panjab University w.e.f. 23 July 2018. Prof.R.K. Pandey, Former Director, Dean & Head of the Institute appointed as Distinguished Professor in the Institute. Mr. Aman Pathak, Ms.Dilpreet Kaur and Mr. Shariq Suhail students of MBA IB, 1st Year of the Institute achieved the position of national finalist at IIT-Kanpur's Finance case study competition, "Vittraj" in Prabandhan 17. Three Research Scholars of the Institute, Ms. Anupama Asthana (Supervisor: Prof. R.K. Lodhwal), Mr. Om Jee Gupta (Supervisor: Dr. Anurag Singh) and Mr. Sandeep Kumar (Supervisor : Dr. Amit Gautam) visited China as part of the Indian youth Delegation to China 2017 from 09th to 16th June, 2017. Ms. Aparna Singh, Research Scholar in the Institute pursuing her Ph.D. under the guidance of Prof. Usha Kiran Rai attended and presented paper in the International Conference: "Heading Global Conference", organized by The Public Authority for Applied Education and Training (PAAET) held at Regency, Kuwait city, Kuwait, between 14-16November, 2016. She also attended Spring-session Short-term Courses of "Strategy" in Harvard Business School, Harvard University and "Psychology" in the University of Cambridge in January, 2017. Selected for Indian Youth Delegation to various Countries: Ms. Garima Research Scholar in the Institute pursuing Ph.D. under the supervision of Prof. H.C. Chaudhary got selected by the Ministry of youth Affairs & Sports, Government of India for Indian Youth Delegation program to various countries. Under this program, Ms. Garima visited Nepal from 10th to 17th March 2017. Team of students of the Institute presented in the National Final of Hult Prize India 2017 held on 15 January 2017 at Gurgaon. One among 25 Start-up Teams shortlisted by an Independent Judge Panel. Prof. H.C. Chaudhary represented the Faculty and won Silver Award in the Indian Management Conclave 2014 held in New Delhi on 8-9 August 2014 for his presentation on SoIL Social Innovation Leadership. Prof. H.C. Chaudhary has been nominated for Best Professor in Human Resource Management of Dainik Bhaskar National Education Leadership Awards 2013 (23 October 2013 at Mumbai). Prof. S.K. Singh (Presently on Deputation as Visiting Professor- ICCR Chair Professor in Management Studies, Pokhra University, Nepal)has been awarded Indo-Nepal Co-operation Award (Kathmandu, Nepal on 19th October, 2013). Prof. H.C. Chaudhary has been nominated for Best Teacher in Marketing Management of AMAR UJALA B-School Excellence Awards 2012 (23 November 2012 at Mumbai). Prof. Chaudhary also won Indian Achievers' Award 2012 (Indian Achievers Forum)and Best Citizens of India Award by Best Citizens of India International Publishing House during November-December 2012. Professor S.K. Singh got deputation as ICCR Chair Professor (Management) of Ministry of External Affairs, GoI (August 2012). This is the only Professorial Chair of ICCR (Indian council for cultural Relations) for Management discipline. Professor H.C. Chaudhary has been selected for Rashtriya Gaurav Award and a Certificate of Excellence by India International Friendship Society to be conferred on 29th of August 2012 in a Conference on Economic Growth and National Integration at New Delhi. The past recipients of the prestigious Award include: Former Vice President, Governors, Chief Ministers, Senior Academicians, Cricketers and many other distinguished leaders from different walks of life. Professor H.P. Mathur won Nurturer of Talent and Best Placement Officer Awards in the World Ecucational Congress held at Taj Lands End (Bandra) Mumbai on 29 & 30, 2012. Economic Growth Society of India has decided to honour Prof. S.K. Singh, Dean, Faculty of Management Studies, Banaras Hindu University with the award of Gold Star Asia International Award for his remarkable achievements towards the progress and development of management education in the year 2012. Prof. S.K. Singh, Dean, FMS, BHU won Asia Pacific International Award of the Global Achievers Foundation for remarkable achievements towards the progress and development of management education in the year 2012 (Tashkant on 18th May 2012). Prof. S.K. Singh, Dean, FMS, BHU won Bharat Vidya Shiromani Award and a Certificate of Education Excellence by Indian Solidarity Council (March 2012). International Institute of Education and Management, New Delhi honored Professor Singh with Rashtriya Vidya Gaurav Gold Medal Award (March 2012). 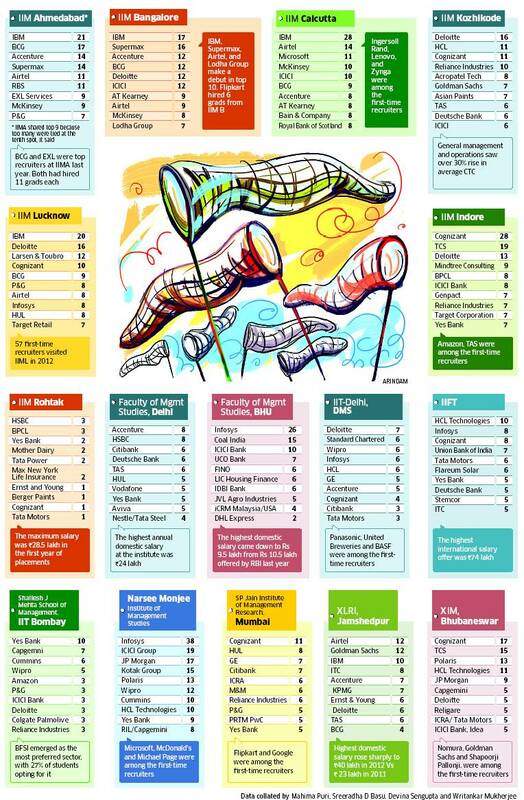 The Institute of Management Studies (FMS), BHU is reflected in the Top Recruiters Survey 2016 concudted by the Economic Times (18 August 2017, Delhi Edition, Page 20). It has reported: "Now in its sixth year, the ET Top Recruiters survey was based on data collated from 26 leading Indian business schools. These are: ....... Institute of Management Studies, BHU (earlier FMS, BHU) ....."
FMSBHU has won Silver Award in the Indian Management Conclave 2014 held in New Delhi on 8-9 August 2014 for presentation on SoIL (Social Innovation Leadership by Professor H.C. Chaudhary. FMS BHU is one among the top 21 B-Schools based on Campus Placements. 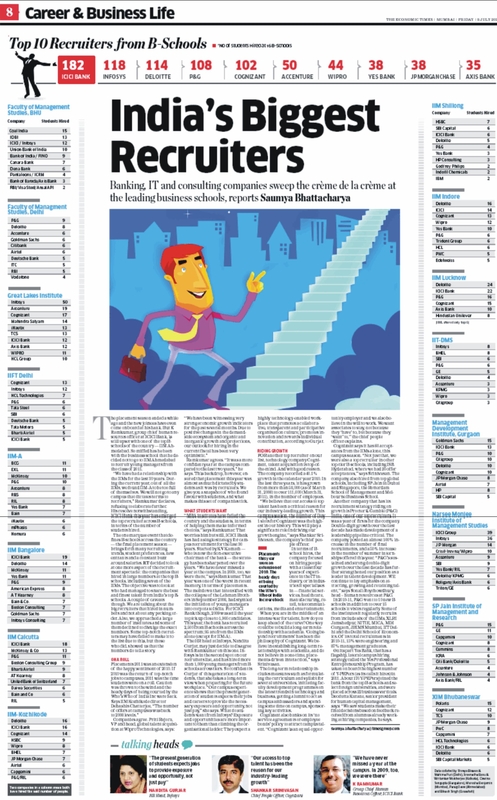 It has reported: "The ET reached out to the countr's top 21 B-Schools and compiled hiring data from nearly a 100 companies to put together the forth edition of India's top Recruiters List. 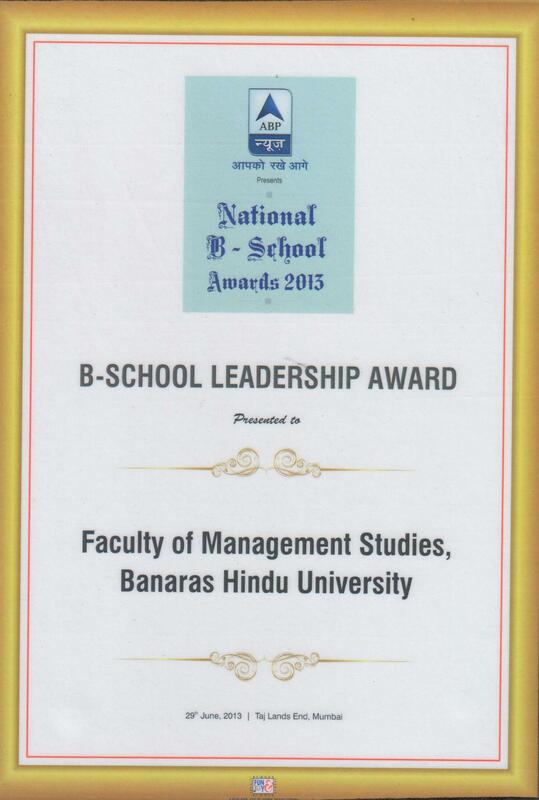 These included ............. FMS, BHU (Faculty of Management Studies, Banaras Hindu University) ....."
FMSBHU has been awarded for the Lokmat National Education Leadership Award (for B-School with Industry Related Curriculum in International Business). FMSBHU has been awarded for the Dainik Bhaskar National Education Leadership Award 2013 (for B-School with Industry Related Curriculum in International Business) (23 October 2013 at Mumbai). B-School Leadership Award was presented to FMS BHU in a glittering function by the ABP News National B-School Award 2013 on 29th June 2013 at Mumbai. DNA & Stars of the Industry Group conferred Innovative Business School Award on Innovation in Building Academic & Industry Interface to the Faculty of Management Studies, Banaras Hindu University. The award is in recognition of leadership, development, innovation and industry interface of Business school. FMS, BHU won prestigious awards in the AMAR UJALA B-School Excellence Awards 2012. The Faculty won Best B School (Industry related Curriculum in International Business) and Prof. H.C. Chaudhary won Best Teacher in Marketing Management. (23 November 2012 at Taj Lands End, Mumbai). The awards are in recognition of leadership, development and industry interface. FMS, BHU won three prestigious awards in the World Educational Congress 2012 (institutional and individual category). The Faculty won B-School Leadership Award and Prof. H.P. Mathur won Nurturer of Talent and Best Placement Officer Awards in the World Ecucational Congress held at Taj Lands End (Bandra) Mumbai on 29 & 30, 2012. 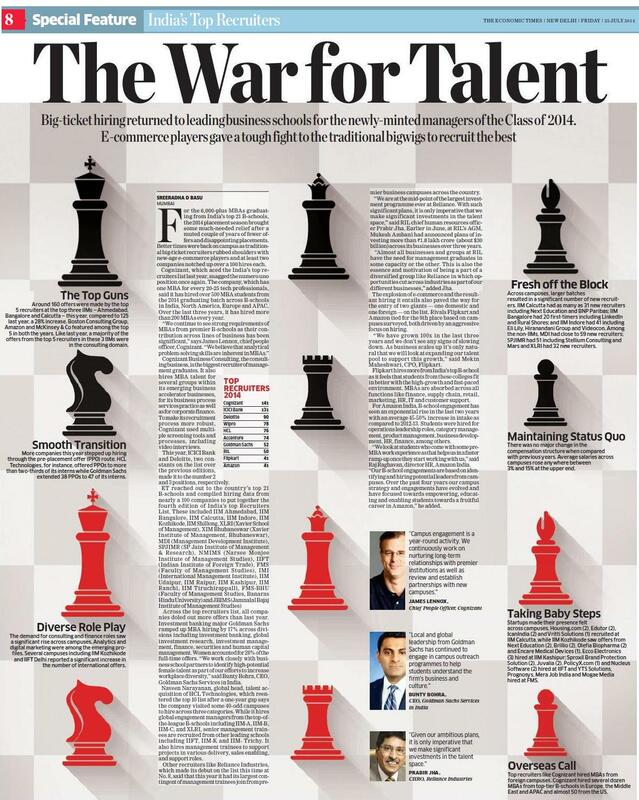 FMS, BHU appeared among top 16 institutions in a recent survey conducted by Economic Times on recruiters perspective. The survey was based on information collection earlier. The maximum salary offered during 2012-13 was 14 lakhs. FMSBHU among the 16 b-schools on biggest recruiters of the year survey conducted by the Economic Times, released on 9th July 2011. The Faculty of Management Studies, Banaras Hindu University, again proving its mettle, through dedicated efforts and meaningful contributions, was able to achieve galloping advancement by making its Overall Ranking to 14th during 2011 surpassing many reputed b-schools of the Country, as per the Survey Results released in the Business World (June 27, 2011 issue). (Last year, the ranking was 28). Pt. Madan Mohan Malviya, this elevation energizes and enable us to look beyond the horizon with great enthusiasm and face emerging challenges ahead.